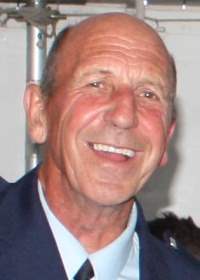 Former Fire Chief, Martinborough Fire Brigade. Suddenly on 18th January 2019. Beautiful husband of Dianna; and the late Margaret. Dearly loved and cherished father of Jason, Susanne, and Amy. Treasured Grandad of April, Matthew, Sam, Taine, Alexis, Seth, Santana and Maggie. Much loved brother of Donald, Laureen, and Rex. In lieu of flowers donations to Suicide Prevention C/- The Mental Health Foundation of NZ, PO Box 10 051, Dominion Road, Auckland, 1446, would be appreciated and may be left at the service. A service for Garry will be held at the Martinborough Fire Station, Texas Street, Martinborough on Friday 25th January 2019 at 1.00pm, followed by burial at the Martinborough Lawn Cemetery. Susanne, Amy and Jason would like to express their sincere thanks to all who supported us in various ways during the recent sad and sudden loss of our father. We have appreciated all your messages, tributes and support. We would like to send a special thanks to: John and Sandra Hargreaves, David Kershaw, Conor Kershaw and all the staff of Pain and Kershaw, Bruce and Sue Sutherland, Robyn and Bruce Mountain, Rick and Pete, Bill and Kate Butzbach, Chris Hooson, Laura Atkinson, Charmaine Theobald, Joanna Scott; all our aunts, uncles and extended family; all those that travelled from near and far to be with us at the service; those who made donations to Suicide Prevention; the Martinborough Fire Brigade Family; and the whole Martinborough and Wairarapa communities. Your love and support has been so appreciated. We can never thank you all enough, but as we all try to rebuild ourselves your continued support is so valued. Garry touched the lives of so many wonderful people. Speak even if your voice shakes. Thank you all, Jason.